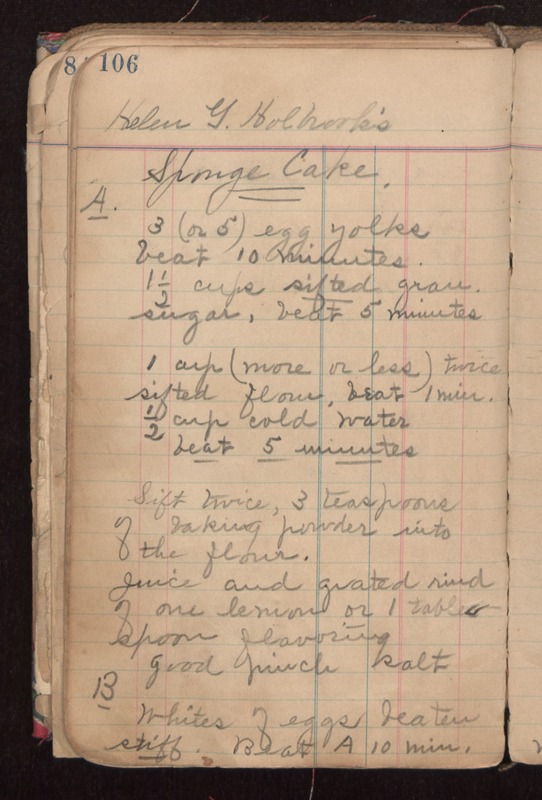 Helen G. Holbrook's Sponge Cake. A. 3 (or 5) egg yolks beat 10 minutes. 1 1/2 cups sifted gran. sugar, beat 5 minutes 1 cup (more or less) twice sifted flour, beat 1 min. 1/2 cup cold water beat 5 minutes Sift twice, 3 teaspoons of baking powder into the flour. Juice and grated rind of one lemon or 1 tablespoon flavoring good pinch salt B Whites of eggs beaten stiff. Beat A 10 min.